Urinary incontinence is not something most women talk about with their friends. Nor do they like to admit that it affects their daily lives. Unfortunately, it is a common condition that is prevalent in up to 55% of women between 15 and 64 years of age. Many people assume urinary incontinence is a normal part of aging or a consequence of childbirth. It does not have to be and there is effective treatment for it. There are three different types of urinary incontinence. Stress incontinence occurs when there is some type of exertion. This may include coughing, sneezing, running or jumping with involuntary leakage of urine. Urge urinary incontinence is involuntary leakage when there is the urge to urinate. Many women can relate to having this urge for example, when putting the keys in the front door when they get home or even the sight of the toilet in the bathroom. The last type of urinary incontinence is mixed urinary incontinence. This complaint is associated with leakage with exertion and urge. Urinary incontinence can result for numerous reasons. The pelvic floor muscles are often implicated in involuntary leakage. The muscles of the pelvic floor are the support system of the abdominal contents. These muscles need to be strong enough to support the organs and keep urine in the bladder, but they also need to be able to relax for urination and defecation. Normal urination occurs when the muscles of the pelvic floor relax to allow urine to flow from the bladder to the urethra. When the bladder is done emptying, the pelvic floor muscles return to a higher level of tension, or resting tone, in order to close sphincters and maintain continence. Therefore, if the muscles are too weak, urine can easily leak out, but on the flip side, if muscles are too tense, they can stimulate the bladder too much. Many women suffer unnecessarily because of urinary incontinence. Changes in lifestyle range from wearing pads, to avoiding activity and exercise, to mapping out bathrooms in all public places. These behaviors are completely unnecessary. All of the different types of urinary incontinence can be treated with conservative measures. Physical Therapists specializing in pelvic floor dysfunctions can perform an extensive evaluation to determine the cause of urinary incontinence and develop an effective treatment plan for each individual. There are exercises that will increase the resting tone and strength of the pelvic floor muscles. Dietary changes and behavior modifications will also help to decrease urinary leakage. 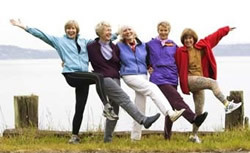 It's never too late to do something about urinary incontinence. You will be able to get your life back and return to activities and exercise that make you feel good! Please contact us if we can help you.